This post is a BizzyBlog Easter tradition. 1 In the end of the sabbath, as it began to dawn toward the first day of the week, came Mary Magdalene and the other Mary to see the sepulchre. 2 And, behold, there was a great earthquake: for the angel of the Lord descended from heaven, and came and rolled back the stone from the door, and sat upon it. 3 His countenance was like lightning, and his raiment white as snow: 4 And for fear of him the keepers did shake, and became as dead men. 5 And the angel answered and said unto the women, Fear not ye: for I know that ye seek Jesus, which was crucified. 6 He is not here: for he is risen, as he said. Come, see the place where the Lord lay. 7 And go quickly, and tell his disciples that he is risen from the dead; and, behold, he goeth before you into Galilee; there shall ye see him: lo, I have told you. 8 And they departed quickly from the sepulchre with fear and great joy; and did run to bring his disciples word. 9 And as they went to tell his disciples, behold, Jesus met them, saying, All hail. And they came and held him by the feet, and worshipped him. 10 Then said Jesus unto them, Be not afraid: go tell my brethren that they go into Galilee, and there shall they see me. 11 Now when they were going, behold, some of the watch came into the city, and shewed unto the chief priests all the things that were done. 12 And when they were assembled with the elders, and had taken counsel, they gave large money unto the soldiers, 13 Saying, Say ye, His disciples came by night, and stole him away while we slept. 14 And if this come to the governorâ€™s ears, we will persuade him, and secure you. 15 So they took the money, and did as they were taught: and this saying is commonly reported among the Jews until this day. 36 And as they thus spake, Jesus himself stood in the midst of them, and saith unto them, Peace be unto you. 37 But they were terrified and affrighted, and supposed that they had seen a spirit. 38 And he said unto them, Why are ye troubled? and why do thoughts arise in your hearts? 39 Behold my hands and my feet, that it is I myself: handle me, and see; for a spirit hath not flesh and bones, as ye see me have. 40 And when he had thus spoken, he shewed them his hands and his feet. 41 And while they yet believed not for joy, and wondered, he said unto them, Have ye here any meat? 42 And they gave him a piece of a broiled fish, and of an honeycomb. 43 And he took it, and did eat before them. 44 And he said unto them, These are the words which I spake unto you, while I was yet with you, that all things must be fulfilled, which were written in the law of Moses, and in the prophets, and in the psalms, concerning me. 45 Then opened he their understanding, that they might understand the scriptures, 46 And said unto them, Thus it is written, and thus it behoved Christ to suffer, and to rise from the dead the third day: 47 And that repentance and remission of sins should be preached in his name among all nations, beginning at Jerusalem. 48 And ye are witnesses of these things. 49 And, behold, I send the promise of my Father upon you: but tarry ye in the city of Jerusalem, until ye be endued with power from on high. 1 The first [day] of the week cometh Mary Magdalene early, when it was yet dark, unto the sepulchre, and seeth the stone taken away from the sepulchre. 2 Then she runneth, and cometh to Simon Peter, and to the other disciple, whom Jesus loved, and saith unto them, They have taken away the Lord out of the sepulchre, and we know not where they have laid him. 3 Peter therefore went forth, and that other disciple, and came to the sepulchre. 4 So they ran both together: and the other disciple did outrun Peter, and came first to the sepulchre. 5 And he stooping down, [and looking in], saw the linen clothes lying; yet went he not in. 6 Then cometh Simon Peter following him, and went into the sepulchre, and seeth the linen clothes lie, 7 And the napkin, that was about his head, not lying with the linen clothes, but wrapped together in a place by itself. 8 Then went in also that other disciple, which came first to the sepulchre, and he saw, and believed. 9 For as yet they knew not the scripture, that he must rise again from the dead. 10 Then the disciples went away again unto their own home. 11 But Mary stood without at the sepulchre weeping: and as she wept, she stooped down, [and looked] into the sepulchre, 12 And seeth two angels in white sitting, the one at the head, and the other at the feet, where the body of Jesus had lain. 13 And they say unto her, Woman, why weepest thou? She saith unto them, Because they have taken away my Lord, and I know not where they have laid him. 14 And when she had thus said, she turned herself back, and saw Jesus standing, and knew not that it was Jesus. 15 Jesus saith unto her, Woman, why weepest thou? whom seekest thou? She, supposing him to be the gardener, saith unto him, Sir, if thou have borne him hence, tell me where thou hast laid him, and I will take him away. 16 Jesus saith unto her, Mary. She turned herself, and saith unto him, Rabboni; which is to say, Master. 17 Jesus saith unto her, Touch me not; for I am not yet ascended to my Father: but go to my brethren, and say unto them, I ascend unto my Father, and your Father; and [to] my God, and your God. 18 Mary Magdalene came and told the disciples that she had seen the Lord, and [that] he had spoken these things unto her. 19 Then the same day at evening, being the first [day] of the week, when the doors were shut where the disciples were assembled for fear of the Jews, came Jesus and stood in the midst, and saith unto them, Peace [be] unto you. 20 And when he had so said, he shewed unto them [his] hands and his side. Then were the disciples glad, when they saw the Lord. 21 Then said Jesus to them again, Peace [be] unto you: as [my] Father hath sent me, even so send I you. 22 And when he had said this, he breathed on [them], and saith unto them, Receive ye the Holy Ghost: 23 Whose soever sins ye remit, they are remitted unto them; [and] whose soever [sins] ye retain, they are retained. 24 But Thomas, one of the twelve, called Didymus, was not with them when Jesus came. 25 The other disciples therefore said unto him, We have seen the Lord. But he said unto them, Except I shall see in his hands the print of the nails, and put my finger into the print of the nails, and thrust my hand into his side, I will not believe. 1 And when the sabbath was past, Mary Magdalene, and Mary the mother of James, and Salome, had bought sweet spices, that they might come and anoint him. 2 And very early in the morning the first day of the week, they came unto the sepulchre at the rising of the sun. 3 And they said among themselves, Who shall roll us away the stone from the door of the sepulchre? 4 And when they looked, they saw that the stone was rolled away: for it was very great. 5 And entering into the sepulchre, they saw a young man sitting on the right side, clothed in a long white garment; and they were affrighted. 6 And he saith unto them, Be not affrighted: Ye seek Jesus of Nazareth, which was crucified: he is risen; he is not here: behold the place where they laid him. 7 But go your way, tell his disciples and Peter that he goeth before you into Galilee: there shall ye see him, as he said unto you. 8 And they went out quickly, and fled from the sepulchre; for they trembled and were amazed: neither said they any thing to any man; for they were afraid. 9 Now when Jesus was risen early the first day of the week, he appeared first to Mary Magdalene, out of whom he had cast seven devils. 10 And she went and told them that had been with him, as they mourned and wept. 11 And they, when they had heard that he was alive, and had been seen of her, believed not. 12 After that he appeared in another form unto two of them, as they walked, and went into the country. 13 And they went and told it unto the residue: neither believed they them. 14 Afterward he appeared unto the eleven as they sat at meat, and upbraided them with their unbelief and hardness of heart, because they believed not them which had seen him after he was risen. 15 And he said unto them, Go ye into all the world, and preach the gospel to every creature. 16 He that believeth and is baptized shall be saved; but he that believeth not shall be damned. 17 And these signs shall follow them that believe; In my name shall they cast out devils; they shall speak with new tongues; 18 They shall take up serpents; and if they drink any deadly thing, it shall not hurt them; they shall lay hands on the sick, and they shall recover. Apr 8, 2019 / 12:01 pm (CNA).- The Holy See’s representative to the United Nations told the UN Commission on Population and Development that insistence upon a “right to abortion” at their annual spring meeting detracts from the commission’s efforts to address the real needs to mothers and children. After UN representatives from European countries called for “speeding up progress” toward “universal access to sexual and reproductive services, including safe and legal abortion,” Archbishop Bernardito Auza, the Holy See’s Permanent Observer to the UN, spoke out. And they crucified him, and parted his garments, casting lots: that it might be fulfilled which was spoken by the prophet, They parted my garments among them, and upon my vesture did they cast lots. And sitting down they watched him there; And set up over his head his accusation written, THIS IS JESUS THE KING OF THE JEWS. Now from the sixth hour there was darkness over all the land unto the ninth hour. And about the ninth hour Jesus cried with a loud voice, saying, “Eli, Eli, lama sabachthani?” that is to say, “My God, my God, why hast thou forsaken me?” Some of them that stood there, when they heard that, said, “This man calleth for Elias.” And straightway one of them ran, and took a spunge, and filled it with vinegar, and put it on a reed, and gave him to drink. The rest said, “Let be, let us see whether Elias will come to save him.” Jesus, when he had cried again with a loud voice, yielded up the ghost. And, behold, the veil of the temple was rent in twain from the top to the bottom; and the earth did quake, and the rocks rent; And the graves were opened; and many bodies of the saints which slept arose, and came out of the graves after his resurrection, and went into the holy city, and appeared unto many. A religious sister can expect that if she is faithful to her vows, fervent in prayer, and zealous in following Jesus, her face might someday wind up on the front of a holy card. “To be a good athlete, you have to be strong in body, mind, and spirit,” Sobieck told Runner’s World. After Sobieck’s pitch, Topps decided to place her on a baseball card in their Allen and Ginter series, which features baseball players along celebrities. The story of Cyprien and Daphrose Rugumba is a story of atheism and devout faith, of a strained marriage and a love that overcomes obstacles, of a powerful conversion that was able to change an entire life. Cyprien and Daphrose were murdered 25 years ago, at the start of the 1994 Rwandan genocide. Today, their cause for sainthood is open, and their impact lives on through the Emmanuel Community, an international Catholic association of the faithful focused on adoration, compassion and evangelization, which the couple brought to Rwanda. Mexican president Andrés Manuel López Obrador wrote last month to Pope Francis and the King of Spain, Felipe VI, asking for an apology for the abuses committed during conquest of Mexico by Spanish Catholics in the 16th century. Spain dismissed López Obrador’s request, while the Vatican recalled that Pope Francis, as well as his predecessors, have asked forgiveness for the “many and grave sins” committed during the conquest of the Americas. “This resulted in entire peoples such as the Tlaxcaltecas joining the handful of 200 Spaniards, along with other subjugated peoples joining together, to make possible what just the Spanish alone could never had done,” he said. The only thing Yglesias didn’t specifically admit, which Nathan Wurtzel accurately observed above, is that this twisted form of “success” would not have been achieved without the establishment press. 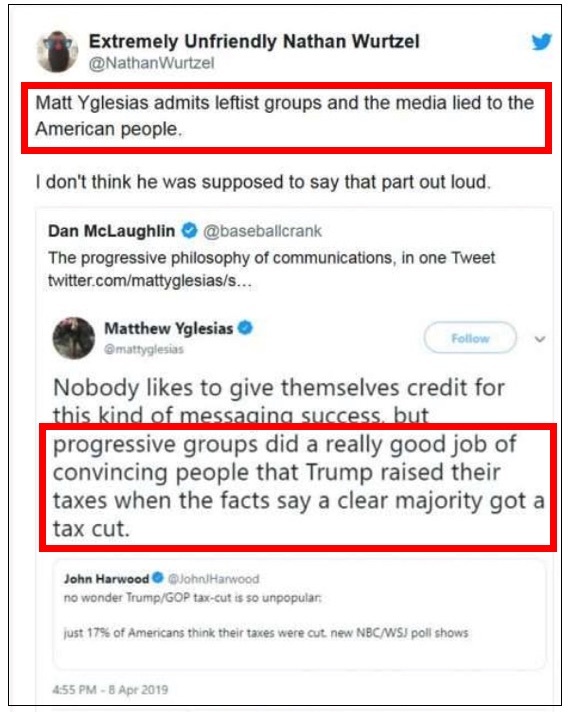 The supposedly “objective” Associated Press, the New York Times, the Washington Post, the cable news channels except Fox, and even most of the financial press either parroted the “progressive” lie to which Yglesias referred or misled their readers and viewers by falsely insisting that upper-income taxpayers would “benefit” the most from the tax cut legislation. But that’s how Yglesias, as seen here, and so many other “progressives” – up to and including Harry Reid and Barack Obama – operate. A considerable degree of central planning in Washington is certainly what Franklin Roosevelt delivered, but it was not what he promised when he was first elected in 1932 (and certainly not during the 1932 campaign — Ed.). 11:20 a.m.: Minnesota Congresswoman Ilhan Omar recently stated that the Council on American-Islamic Relations “was founded after 9/11 because they recognized some people did something.” Setting aside the offensiveness of the remark. The linked CBS news story at least noted that CAIR was founded in 1994. CAIR has had a web presence since late 1996. Sadly, Hamas has succeeded beyond its wildest dreams. The release and success of the pro-life film “Unplanned” is being credited with an uptick in women seeking information on reversing chemical abortions. Following the release of “Unplanned” in theaters on March 29, the hotline registered a 30% increase in calls compared to a normal weekend. “Unplanned” tells the story of former Planned Parenthood Clinic Director Abby Johnson’s ideological transformation into a pro-life advocate.